Restaurant owners and managers strive to maintain an attractive and healthy appearance to make customers feel safe and keep them happy. 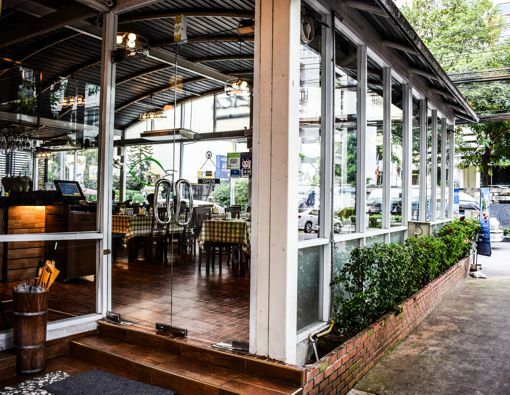 One of the first things those customers will see as they drive up to your restaurant is the windows as they look inside–and you better make sure they can easily see what’s inside waiting for them. Unattractive and dirty windows will cause those customers to move on and find another choice for their meal. All Weather Services will work with you to build a window maintenance and building exterior cleaning plan that keeps your restaurant looking attractive and ready for business. We work around your schedule and never interrupt your traffic flow so customers can keep coming back whenever they want. We provide building washes, concrete cleaning, and awning and blind cleaning to keep your building cleaner longer. We have the equipment to reach your most difficult areas to clean and are bonded and insured to give you peace of mind as your restaurant remains clean. There’s no reason to risk your employees’ safety having them perform cleaning chores they’re neither trained or equipped to perform. We are experts at cleaning and serve restaurant clients throughout the Omaha area as well as the greater Nebraska and Iowa region. We treat your restaurant as we do our own homes–and we provide residential window cleaning services throughout the Nebraska and Iowa region.